"In doing so, we recognized we were looking at carvings that must have required extraordinary creativity and dedication by the artist. As there was no electric power in the North during the time they were created, people had to remain indoors, their lighting by lamps, likely fueled with whale oil. In that dim light, they would take a block of stone and study it, and suddenly see in that block the figure that had been trapped inside. It might be an animal or a shaman—the mission of the artist was to free it from its surroundings." Schwartz saw this process of discovering a piece's potential as the most intriguing aspect of the artists' work, and he wants students in the Edwards School of Business who view the art to be encouraged in their own lives. "I recognized that these were pieces by people working under considerable disadvantage and hardship. They demonstrated creativity and dedication." Since then, he has had a successful career with the energy company Conoco in a variety of roles, including leading international operations to expand the company's reach across Europe and in Libya. Before retiring in 1988, he concluded his career as an executive vice-president of Conoco and as a senior vice-president of DuPont. Now, Schwartz said, it is time to give back. Daphne Taras, dean of the Edwards School of Business, is thrilled that her students will benefit from the donation, and said it helps reinforce the relationship between business and art. "It's completely appropriate for a business school to celebrate artistry." She added the placement of the collection in a well-lit atrium on the main floor of the college will help motivate students in their studies. "The art inspired us to turn what was a very rundown but beautiful atrium … into a living gallery," Taras said. Renovations to the space included installing large, glass display cubes placed intermittently through the atrium between new lounge chairs where business students spend time studying and socializing. "I wanted students to be sitting among the art, so that it's alive within the building. Now, students sit within a foot or two of what is among the most beautiful art in Canada," she said. Schwartz said the placement fits perfectly with his vision and is pleased with his decision to donate the collection to his alma mater rather than a museum because he wanted visitors to have more interaction with the art. "I wanted something inspirational for students that they could see without the reverence of a museum." Kent Archer, director and curator for the U of S art galleries, said the university's collection did not contain anything that would rival this donation but the artworks complement the university collection nicely. "This donation develops our Inuit and First Nations art collections considerably, in both breadth and scope. It contributes important examples of north-west coast art previously not represented in the university collection." He added the argillite and ivory pieces are particularly interesting as they are unique examples of work. Because of the distinctive nature and scope of the collection, Archer worked with independent curator Norman Zepp in the acquisition process. Zepp and Archer visited Schwartz in Naples, Florida to assess and catalogue the collection and were both immediately intrigued. 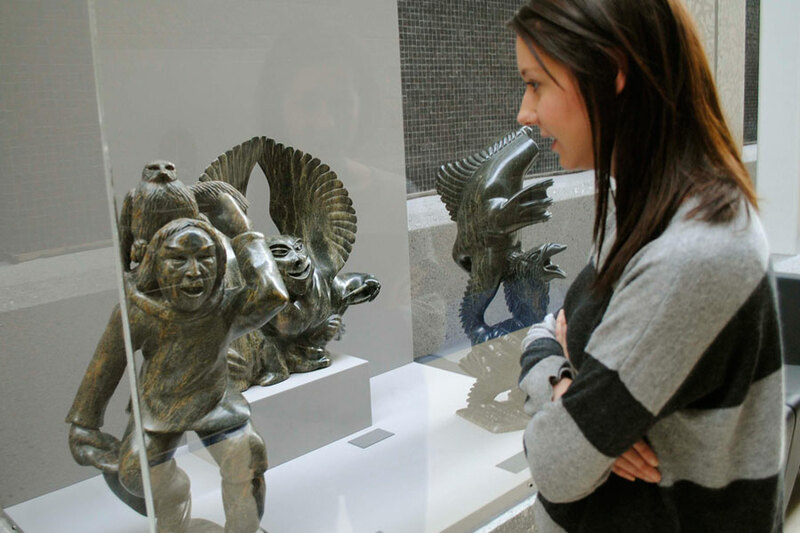 Zepp, who was previously the curator of Inuit art at the Art Gallery of Ontario in Toronto, noted it is "a first-rate collection with very fine examples of sculptures by best-known Inuit artists, and some of their finest examples." The majority of the artworks are on display and there are plans to rotate in other pieces at regular intervals. Schwartz' personal favourite—Drum Dancer—is a carving of a shaman. The piece, he said, is fitting for those looking to achieve more as it represents maximum effort. "Seek the counsel of this piece. If you want stimulation to do more … you just look up at him!" Jessica Elfar is development communications specialist in Advancement and Community Engagement.